Worm rock is produced by worm snails. 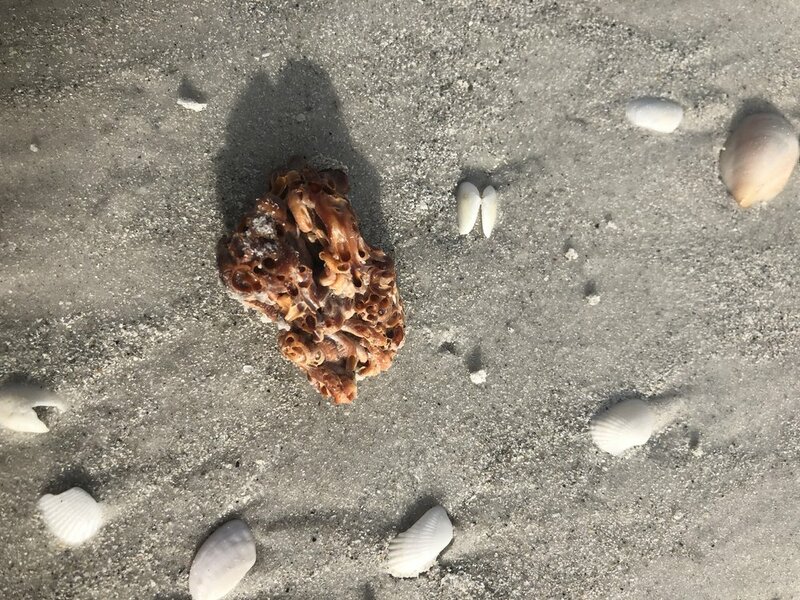 Many people stop by Sanibel Sea School to show us oddly shaped rocks with holes in them, wondering what it is they found on the beach. The answer is worm rock - but is it a worm or a rock? The answer is neither. This calcium carbonate structure is actually created by a marine gastropod, or a type of marine snail called a worm snail. Worm snails belong to the family Vermetidae, and are among the most frequently misidentified animals on our planet. When scientists took a closer look at worm rock, they observed that the inner walls of these shells that come from worm snails have a highly polished shine to them, while actual marine worms (annelids) produce a dull finish. On Sanibel, we most commonly find worm snails. These snails have a strange life cycle compared to other marine snails. After hatching from an egg, their coiled larvae will uncoil and begin an irregular growth pattern. Later, they will attach to a hard surface like a rock, or even to mangrove roots or blades of seagrass. There, they build the shell or 'rock' by secretion of calcium carbonate. Just like other gastropods, they have a spiraled shell, but theirs is less regular than the typical snail’s. Of the 11 known species in Southwest Florida, some will colonize together in large clumps, while others will lead solitary lives. The colonies are the ones we often find on our beaches. Once established, they feed on small plankton and other particles in the water, which they pump over hair-like structures on their gills. The main species found in our area are the dark worm snail and the variable worm snail, which both have the ability to colonize into massive structures – sometimes so large that they are reef-like! It is extremely hard to distinguish between the two species, and many times they are misidentified as the same thing. Next time you are on the beach and find one of these peculiar structures, think about what it would be like to live with so many neighbors!